When people see an old-school analog mixing console for the first time, they’re often struck by the sheer number of buttons, knobs, and faders. In fact, what you’re looking at is actually just dozens of duplicates of a set of integrated controls called a channel strip. An analog channel strip consists of an input section (selectable between mic and line, with the former engaging a mic preamp) and an output section consisting of a number of buss assign switches, plus EQ controls (varying from basic to quite complex), a number of aux sends, and a familiar level fader. Some also include dynamics processors such as compressor/limiters and expander/gates. A channel strip provides all the components required to route and process a single input signal. Stick a bunch of them into a metal frame and you’ve got everything you need to process, and mix together multiple signals—hence the term mixing console (or simply, mixer). Today’s DAW software takes care of input selection and buss/aux routing control, so there’s no need to duplicate those controls in a plugin. Other than that, channel strip plugins offer everything an analog channel strip does: input/output level control, preamp emulation, EQ, and dynamic processing, all integrated in one graphic display. 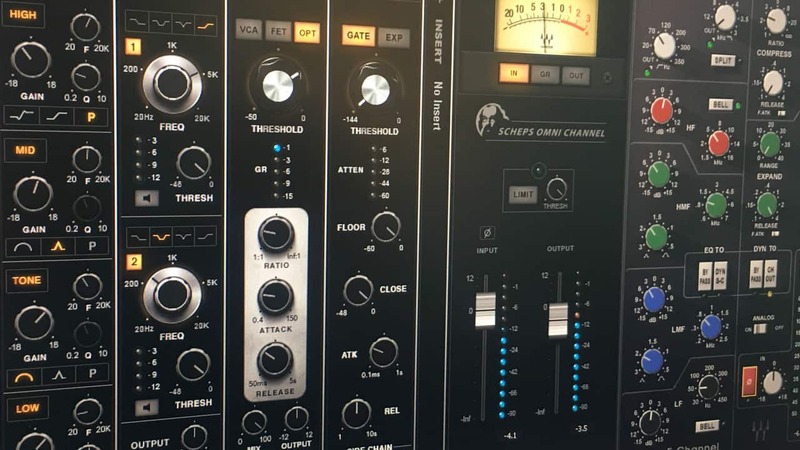 Why use a channel strip plugin? At this point, you may well be asking yourself: Why do I need a channel strip plugin when there are so many dedicated EQ, dynamics processing, and preamp emulation plugins out there? There are two main answers to that question: Convenience, and cohesive sound. Sure, you can construct your own custom channel strip by stringing together a number of individual specialized plugins, but let’s face it, it’s far more convenient—and a whole lot faster—to open one plugin with all the tools you need rather than switching between three or four of them. This helps speed your workflow—something that’s important enough in music projects, but always critical in budget-tight broadcast and film projects. Like the circuitry design in an analog channel strip, the virtual modules in a digital channel strip plugin are carefully crafted so you don’t end up with a patchwork of processes that don’t belong together; they are specifically designed to work together to deliver a cohesive sound. Modeled plugins provide faithful emulations of the interactions and unique tonal qualities of channel strips from some of the world’s most revered vintage analog mixing consoles. These include the EMI TG12345 Channel Strip and REDD (modeled from the originals built for Abbey Road Studios), Helios modeled as Kramer HLS Channel, and the popular SSL E, and SSL G-series consoles. In essence, they allow you to install any of these behemoths—if you could find and afford one, that is—in even the most modest home recording space. When you’re writing and arranging, tracking or overdubbing, the last thing you want to do is waste precious time hunting through plugins, deciding in what order to insert them, then auditioning presets to see if the compressor or EQ unit you chose was a good one. Doing so slows down the entire creative process, to the point where you may lose creative focus and a potential gem may never get recorded! Whether you’re recording yourself or another performer, you don’t want to be trying out dozens of plugins in the middle of the flow. Much better to have one single plugin—i.e., a channel strip—that gives you everything you need, instantly at your fingertips. Clearly, channel strip plugins are indispensable for digital recording, but guess what? They’re also really handy for mixing. There are several reasons why. Initially, most of your mix decisions are guided by your first impressions of the material. During that crucial period, it’s important to be efficient, to quickly create a rough mix and establish the moves you’ll need to make in each section of the song. In the next phase, you start doing some fine tuning as you see how the tracks are working together (or not). Here, cohesive sound is critical. The last phase, after an overall balance is created, is to make minute tweaks to complete your sonic painting, and once again channel strip plugins—which provide you with the security of knowing that adjusting one component won’t throw the others wildly out of balance—provide an ideal solution. When you think about it, most mixing comes down to adjusting volume, EQ, and compression. These decisions are the ones that have the greatest impact on the final sound of the mix; they’re usually far more consequential than other elements like the usage of effects. A channel strip plugin provides everything you need to control those basic elements, maintaining focus on the things that will make the biggest difference in your mix, thereby allowing you to get closer to your goals in less time. Don’t believe it? Try giving yourself this challenge when you sit down to mix your next song: Create a great mix with channel strip plugins and nothing else. Work to the point where your mix sounds amazing—you’ll be amazed at how much you can accomplish with just that one set of tools. 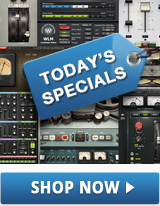 Then, and only then, incorporate other plugins to enhance your already great mix. This is a powerful approach that can give you a whole new level of confidence, plus it’s a great a way to streamline your workflow and attain a consistent sound. The only real drawback to using a channel strip plugin is that it more or less ties you to a specific sonic color, and sometimes limits your flexibility too. For example, no matter how much you change the EQ or dynamics processing settings in the SSL E-Channel or SSL G-Channel plugin, it will still impart the sonic characteristic of an SSL console (which is rarely a bad thing). And while these particular plugins, like most Waves channel strip plugins, allow you to place the EQ either before or after dynamics processing, some channel strips offer little or no flexibility in terms of the order in which a signal gets passed from one module to the next. All that has changed, however, with the Scheps Omni Channel—an evolved channel strip plugin that adds immense versatility to the equation; it’s the channel strip of all channel strips. Designed in conjunction with Grammy-winning mixer Andrew Scheps (Adele, Jay Z, Metallica), this exciting new channel strip provides a fully adjustable selection of Andrew’s time-tested combinations of compression, EQ, saturation and more—some based on classic hardware units, others innovative modules developed from scratch—each with its own unique character. What’s more, these modules can be arranged in any order (just click and drag), giving you the best of a cohesive sound with a fast, intuitive interface. A Pre module that provides three types of analog-style saturation, letting you add diverse colors of harmonic distortion as well as filters and thump (resonance) controls. Similarly, the Compression module features three completely different compressors ranging from fast to slow and smooth, with a unified set of controls so you can simply dial in your settings and then toggle between the three to quickly compare them and find the sonic character that best fits your taste. A 4-band EQ module that allows you to choose different colors reminiscent of familiar analog EQs, all with a distinctly musical sound. Any band can be switched to fully parametric if surgical EQ is required. A Gate module that not only provides all the standard controls (threshold, attack and release) for gating or expansion, but also lets you adjust the maximum noise reduction to maintain a consistent noise floor. A dedicated de-esser module (called DS2, for “de-esser squared”), with two full-range bands and four filter types that allow it to “de-anything”—i.e., remove any offending frequencies, not just S’s or T’s. For example, you can have one de-esser reduce the low-end resonance of an acoustic guitar, while the other takes care of pick noise on the strings. A Master module that provides adjustable VU metering of input or output level, plus brickwall limiting. The ability to insert an additional Waves plugin of your choice at any stage. This could even be an extra instance of any of the Scheps Omni Channel modules. MS (Mid/Side) processing, with the ability to choose the point in the signal flow where you want it to occur, as well as the point where you want to go back to stereo processing. Internal or external sidechain input for the dynamics processing modules, with filtering and EQ. A unique “Focus” mode, which highlights the most important controls you should be focusing on when adjusting a preset. Scheps Omni Channel was created with the goal of striking the perfect balance between the color and character of traditional hardware consoles and the flexibility of modern modular channel strip plugins. The end result is an integrated set of tools that impart character and color when needed, and surgical precision when that’s required… but delivering cohesive sound no matter how it’s used. Welcome to a whole new world of mixing! Once you've balanced your EQ and dynamics, be sure to double check these 6 tips for adding depth and dimension to your mix. Do you have channel strip tips that we missed? Let us know in the comments below.